This vegetable stuffed vegan brioche loaf is my latest weapon in my battle to get my two year-old to eat some vegetables. 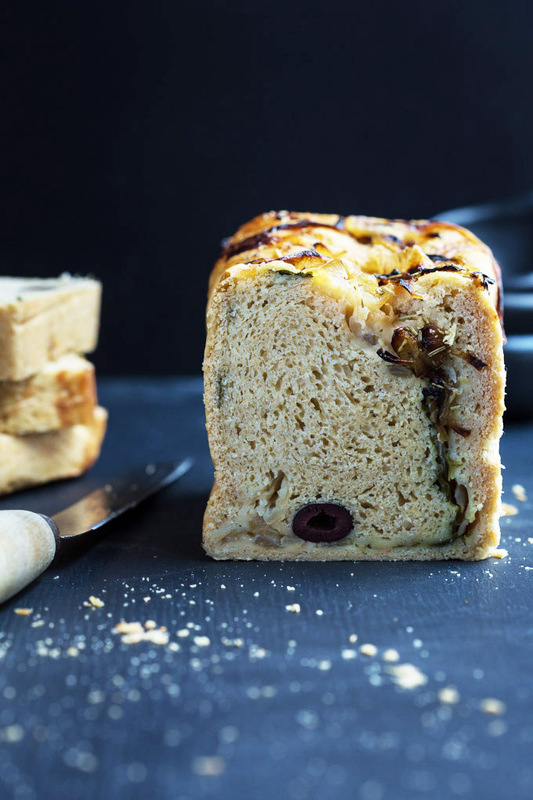 A fresh, buttery loaf filled with cauliflower puree, caramelised onions, baby spinach and olives. The elf never saw it coming. In the ongoing war of the vegetables, I have resorted to much culinary trickery. Muffins, brownies, smoothies and sauces have all been used in our dinner table battle of wills to dupe, make that entice, the elf to eat well. During our latest skirmish, the trumped up little imp (did I say that out loud?) sweetly advised me that I could give all her food to Scout. The elf is not eating vegetables or any dinner anymore. Scout is our Great Dane cross puppy and as I type this post, banging my frustration out on the keyboard, my favourite child. As Winston Churchill said, “Success consists of going from failure to failure without loss of enthusiasm.” In this I am super successful. With every crinkled nose, quivering lip and stubborn pout I am motivated to create more interesting and colourful ways to manipulate my devil-child into a healthy diet. Don’t get me wrong, my daughter is wonderful, caring, funny, smart and kind; she is also two. The way I see it, I am her mother and it is my job to keep her healthy and strong even if it means taking advantage of every small chink in her teeny-tiny armour. Today’s chink is proudly brought to you by every toddler’s friend, the carbohydrate. We are talking bread and not just any bread, brioche. 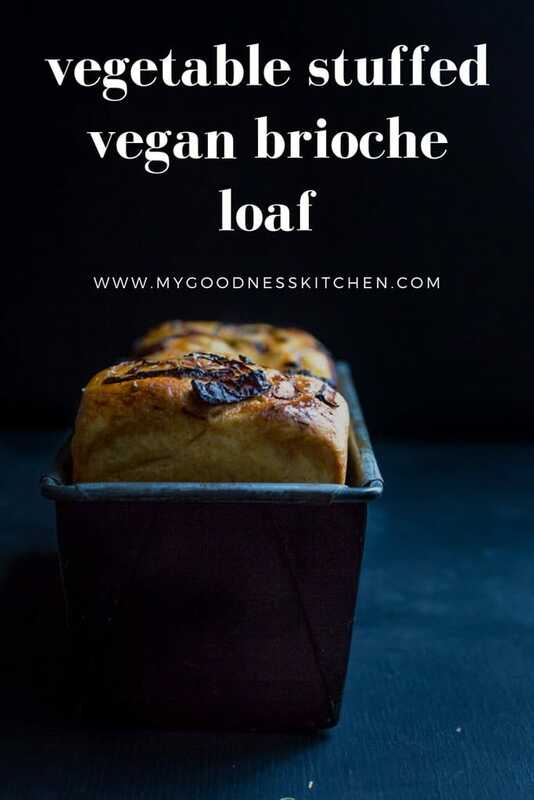 What’s in my Vegan Brioche Loaf? This vegetable stuffed vegan brioche is buttery, slightly sweet and oh so delicious. Each soft, moorish slice tickles the tongue with it’s yeasty, perfectly baked goodness and each piece is laced with an assortment of subtle but delicious vegetables. For this loaf I chose sweet caramelised onions, cauliflower puree, thinly sliced baby spinach and salty black kalamata olives (she likes them, go figure). Wrapped lovingly in sweet, warm brioche the vegetables add contrast and flavour but not enough to deter my small bread-loving fiend. 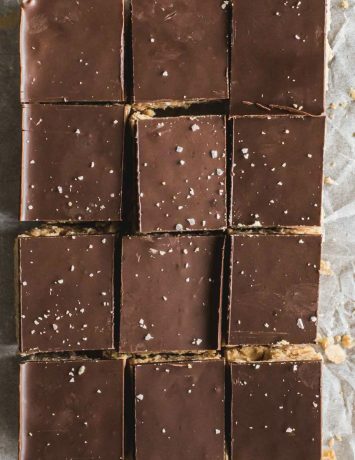 While researching this recipe I came across some wonderful baking sites and tutorials. As many of you know, I am not known for my baking prowess but this video put my fears to rest. This recipe for vegetable stuffed vegan brioche is simple, it was the shaping and handling of the dough that had me in a dither but after watching the tutorial it all came together beautifully. 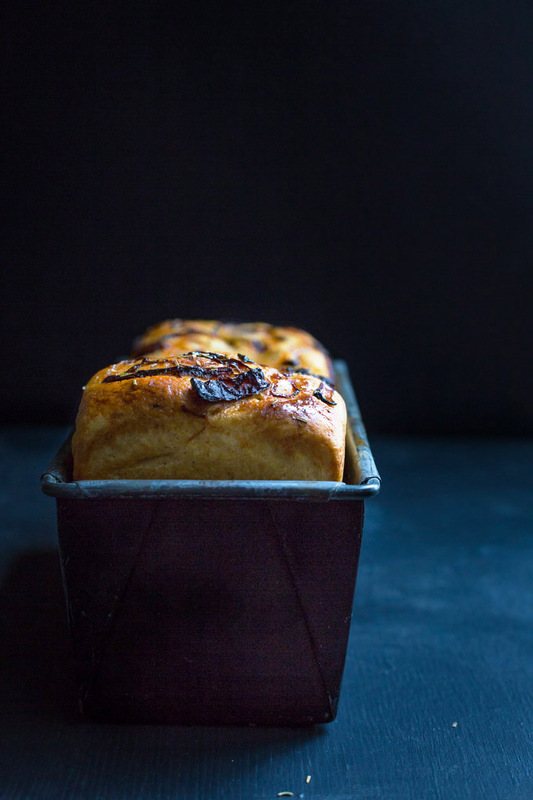 While making a good brioche takes some planning – the dough in this recipe goes in to the fridge overnight- it is worth the time. The bread is buttery and sweet while the vegetables, particularly the caramelised onions and the olives, add contrast and balance. I chose these vegetables strategically but once the dough is made you could add your own flavour with any vegetables. A creamy base such as the cauliflower puree followed by some choice finely chopped veggies will make this brioche your own. 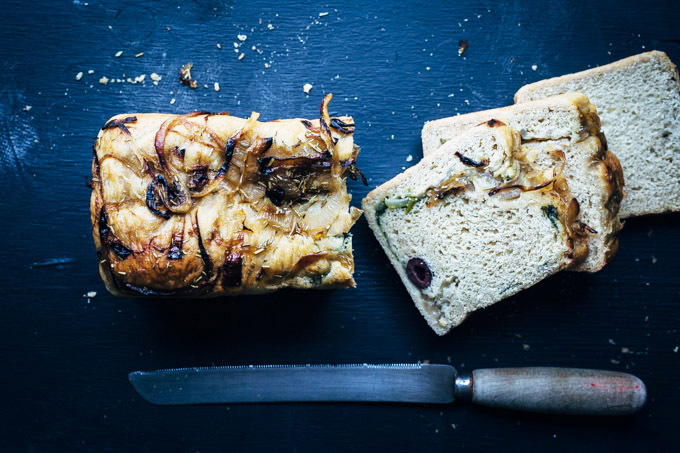 This vegetable stuffed vegan brioche is a deliciously buttery, sweet yet savoury loaf. While I love the balance and the mouth watering goodness, my favourite part of this dish has nothing to do with flavour. I loved watching the elf eat vegetables, wrapped in the security of her beloved bread, her feet dangling from her perch on the stool. This small victory tasted sweeter than the brioche. What can I say? I’m a bit devilish that way. 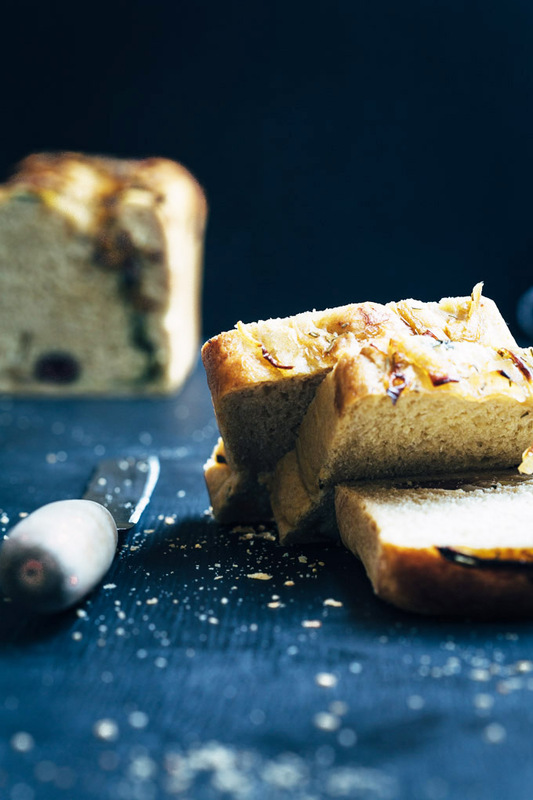 Filled with your favourite vegetables, this vegetable stuffed vegan brioche is a gorgeous buttery loaf perfectly made to impress. Combine 1 cup lukewarm water (39 degrees C), warm milk, yeast and sugar in a bowl. Stand until foamy, about 5 minutes. Make flax eggs by combining 2 tablespoons ground flax with 6 tablespoons water. Make a well in the flour mix and add the yeast mixture and flax eggs. Bring the mixture together with your fingers until it comes together. Pour dough onto a clean, lightly floured surface and knead until smooth and elastic, About 8 to 10 minutes. Add additional flour to the counter if the dough is too sticky. Shape dough into a ball place in a lightly greased large bowl. Cover bowl with plastic wrap and let the dough rise in a warm place until doubled in bulk. I left mine for about 1 1/2 hours. The next day, remove from fridge and allow to sit for 20 minutes to relax. Line a largish bread pan. Roll out dough on a floured surface in to a 1/2 inch thick rectangle. Spread the cauliflower puree over the dough leaving a 1 1/2 inch border around the edges. 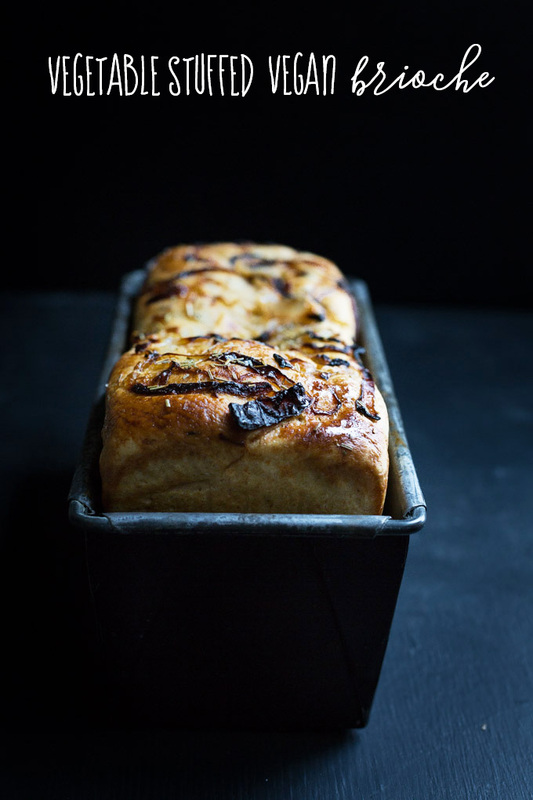 Layer with the caramelised onions (leave some for the top of the loaf). Layer with baby spinach and scatter with olives. Place the rolled dough, seam side down, in the bread pan. Set to rise for 1 hour in a warm place. Pre-heat the oven to 190 degrees C (375 F). Sprinkle remaining onions on the top of the loaf. 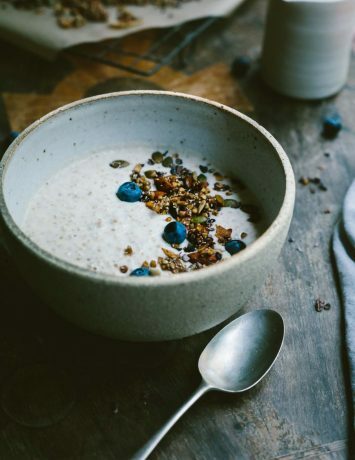 Combine the maple syrup and almond milk in a small bowl and brush on to loaf. Sprinkle with sea salt and dried rosemary. Bake in the oven for 50 minutes.Remove from oven and allow to cool slightly before removing from pan. Aren’t they funny Ceecee? The elf is wonderful but this eating thing can drive a person mad! Let me know how you go with the gluten free flours. I see Bob’s Red Mill makes a baking flour, a 1 to1 flour, but I think it might be a bit expensive. Thanks so much for visiting. Take care. My goodness gracious Amanda, this brioche is spectacular! I can’t wait to give it a go. And bravo on your vegetable trickery. You’re not alone in your battle – Miss 3 flatly refuses to eat anything resembling a potato at home, but will lap up serving after serving of the potato prepared by the cook at daycare. Grrrr!